So, you probably are searching the internet to find out what the heck is a chicken snake, fear no more I will give you some great choices. If you just want a serious answer, it's better to disregard the following list and read just past it. - A genetic experiment that went wrong, when scientists tried to make a long wingless and legless chicken to drive all fried chicken fast food enterprises to bankruptcy. - A snake doing a Marty Mcfly in "Back to the future" and going crazy if anyone calls it "chicken". - The stretched chicken starring in "Hot shots, part Deux", shot by Topper Harley into the chest of the Iraqi terrorist. - Or, wait for it, all snakes are just chickens in disguise, just watch any survival TV show and every single time any wannabe survival expert kill and cooks a snake to eat, you'll hear "tastes just like chicken". Actually none of the above, not even sure if they are even funny, but at least I tried. Chicken snake is the common name given to a number of snake species found in North and Central America, namely in the United States. People use these common names and sometimes the same species has one name in a state and in another is called something else. Or two completely unrelated species are called the same in different parts of the world, or even in the same country. Take for instance the grass snake which may refer to the grass snake (Natrix natrix) found in Europe or the rough green snake (Opheodrys aestivus) or their close relative the smooth green snake (Opheodrys vernalis) found only in the US. To complicate matters even further sometimes the common name indicates a characteristic not relevant to that species. Just look at the mighty King cobra (Ophiophagus hannah) which actually isn't a "true" cobra, like its common name implies since those belong to the genus "naja" such as the Egyptian cobra (Naja haje) which is also known as Asp. That's why scientists use taxonomic systems and scientific names to try and identify all species, not just snakes. But even with a "system" in place they sometimes don't agree, and changes are made, names swapped and reinvented. Now for real, there are several snake species are commonly called chicken snake in the United States, including rat snakes, corn snakes, fox snake, pine snake. The non-venomous western rat snake also found in North America is another species known as the chicken snake. This species has no subspecies currently recognized by scientists and is referred to by other common names such as black rat snake, Texas ratsnake, pilot black snake, or simply as the black snake. ​The eastern ratsnake (Pantherophis alleghaniensis) a non-venomous colubrid snake found in North America and closely related to the western rat snake or black rat snake. 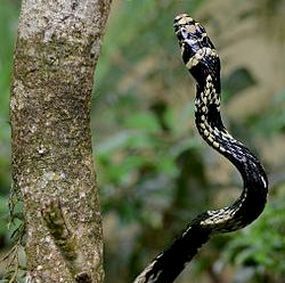 This species is known by other common names such as pilot snake, pilot rat snake. ​Like the caninana (Spilotes pullatus) ​these snakes are called yellow rat snakes in Florida. 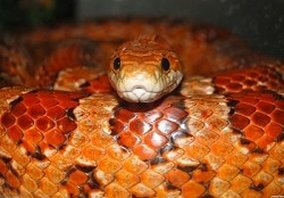 ​The corn snake (Pantherophis guttatus) is found throughout the southeastern and central United States. The species common name origin is one of 2 hypotheses, whether their regular presence near grain stores or the checkered pattern found on their belly. Unfortunately, to these non-venomous snakes they sometimes may resemble other venomous species the copperhead and often killed because of this confusion. The caninana (Spilotes pullatus) is found in southern Central America and northern South America, and Trinidad and Tobago island. 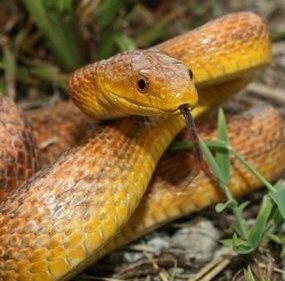 These snakes are obviously called chicken snakes but are also known as the yellow rat snake just like another unrelated species found in the US or serpiente tigre in Spanish.